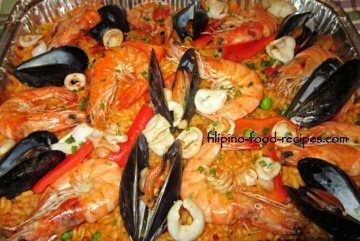 The Paella Filipino is a fancy party dish of rice cooked with chicken and assorted seafood in a seasoned tomato based liquid together with the most expensive spice in the world : saffron. Though the authentic Spanish paella uses Bomba or any similar medium grain rice(Arborio), Filipino paella is not too particular whether we use Jasmine or any other long grain variety. Should it be sticky or should it be loose once cooked? Again, authentic paella is rather loose than sticky, but do as you prefer. 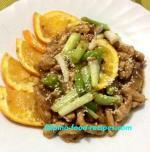 If you know how to cook rice(not talking about using the electric rice cooker), then doing this dish is just a cinch. Like in cooking rice, the amount of liquid you put in will determine whether your rice is sticky or loose. The combination of chorizo, chicken and the seafood mix of shrimp, squid and mussels gives the dish a fancy take, making it a complete meal in itself. The traditional cooking method is over the stovetop using a paella pan, but others prefer the oven so the rice cooks uniformly. 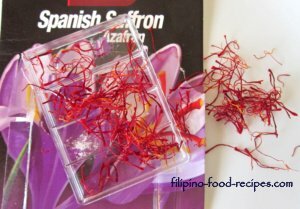 Saffron, the most expensive spice in the world, is not Kasubha, that which is used to top arroz caldo. Saffron has a delicate, distinct taste that is a standard paella ingredient. It has to be steeped in liquid to impart its color and give out its flavor, never to be added directly in the saute. 1 Heat up the chicken broth in a saucepan and add the saffron and bay leaf. 2 Using a 12 inch skillet, heat up 3 tablespoons oil and fry the shrimps briefly, about 1 minute per side just to change color. Set the shrimp aside. 3 Saute the garlic, onion, and bell peppers, then add the chicken pieces and cook until slightly browned. 4 Stir in the rice and chorizo and cook until the rice is slightly opaque, about 3 minutes. Add the crushed tomatoes and bring to a boil. 5 Mix in the squid and chicken broth, taste and season with salt and pepper, then TOP WITH A LID and cook for 15 minutes over medium heat or until rice has absorbed the liquid (but not fully cooked). 6 Add the green peas and arrange the shrimps and mussels on top. TOP WITH LID and cook for another 10 - 15 minutes over low heat or until rice is cooked. 7 Serve the Paella Filipino with slices of lemon and sprinkle of chopped parsley(optional). Want to know the difference in taste Saffron brings to the dish? Taste the chicken broth before and then after you put the saffron. If baking is your preferred cooking method, transfer the dish in an oven-safe dish after Step #4, and no need to cover. If you want loose and fluffy rice for your paella Filipino, about 4 cups of chicken broth is enough. For a sticky rice, use 4 1/2 cups to 5 cups. Remember, the process is not much different from cooking regular white rice on the stovetop where you use medium heat up until the rice absorbs all the liquid, then turning the heat down to low to slowly evaporate the remaining liquid to cook the rice thoroughly without burning (inin). Also, just like cooking regular rice, you need a cover or lid for the skillet to make sure rice cooks evenly. Taste it once rice is fully cooked if seasoned properly(with salt and pepper) -- I use Knorr cube so I hardly use any salt because the cube is salty. Adjust according to your preference.